In my next book — which you’ll be hearing about shortly — there’s a whole section on recipes I call “Keep the Spark Alive” dinners. These meals are the opposite of what we make on, say, a Tuesday night, when efficiency and convenience are the most important ingredients. In some ways, they are the opposite of the DALS mission in general. But that doesn’t mean they aren’t every bit as important, especially when we are talking about the psychological health of a family cook. Think of it this way: If Pretzel Chicken and Beef and Broccoli stir-fries are the workhorse recipes, the ones that get me through the week day in and day out, “Spark” meals are the ones that remind me why I love to cook in the first place. 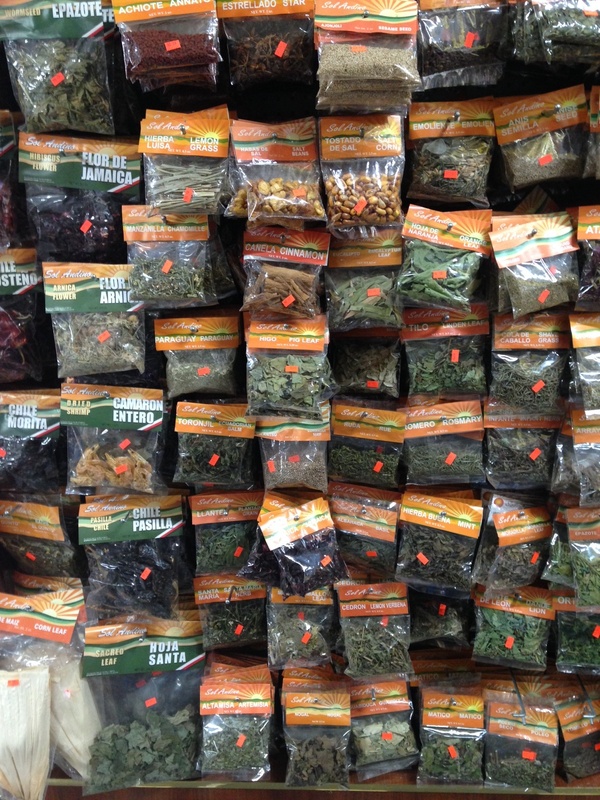 They call for ingredients I’ve never used before and usually require a big chunk of luxurious time. Marcella’s Bolognese is a good example of a Spark dinner, so is Andy Ricker’s Pad Thai. And on this dreary New York morning, I’m pleased to announce, I have a new one to add to the list. It started with Uncle Mike. At our annual Christmas Eve dinner at his house this past year, he served, among a dozen other things, the most amazing Chicken Mole. The chicken was tender and stewy, the sauce was rich and deep, but not overpowering like some versions I’ve tasted in the past. The kids, skeptical at first, cleaned their plates. It was December, which meant by that point in the winter, I had eaten my fair share of braised short ribs at dinner parties, so part of the novelty of this meal was the fact that I was I dining on a hearty, warm-your-bones chicken-based main. Except for maybe Julia Child’s Coq au Vin, I don’t have a whole lot of those in my repertoire that would earn their keep on a holiday spread. “How’d you make your mole?” I asked Mike. Only someone who has never made mole would broach the subject so innocently. But damn that mole was good! It stayed with me all winter, and last week, when I was calendarizing (defined as The act of staring at your family’s schedule to see how you can squeeze some real life in between all the activities) I noticed a nice long empty weekend afternoon and evening. It was going to be our last Saturday without soccer until July, no one was coming over, and just by chance, that morning Abby had an orchestra concert a short drive away from a stretch of awesome Mexican grocers. Mole was calling, and I needed to answer. I’m going to make this happen, I told myself. But not before first checking How to Cook Everything to see what Bittman had to say. 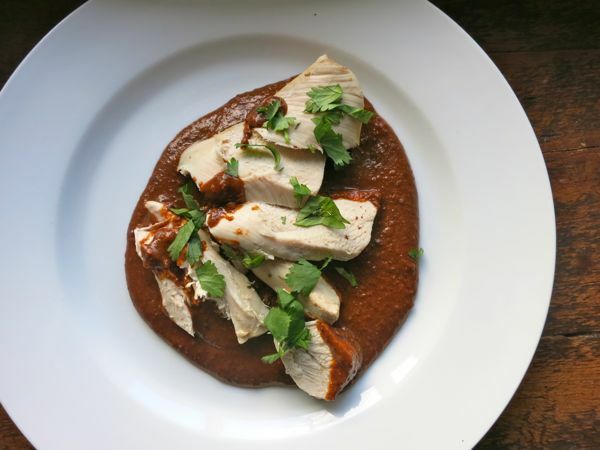 Naturally, the former “Minimalist” columnist acknowledged the complexity of the dish, but offered up a turkey mole that he said was easy and accessible enough to cook on a weeknight. That sentence is like DALS kryptonite, and it took everything in my power to press on. This was not a weeknight. This was not about accessibility. This was about injecting a little bit of adventure into the pasta-and-pizza loop. In search of something in between Bittman and Kennedy, I asked my friend Dana if she had a good mole to recommend. She emailed me Pollo en Mole Poblano, saying said she’d never made it, but had eaten it — and loved it –at many dinner parties. I was sold. …and I had a few moments where I could play bubble, bubble, toil, and trouble. 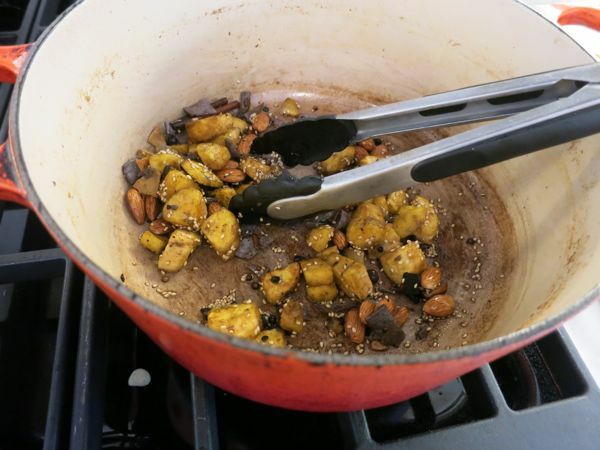 What amazed me was not how many ingredients I got to toss into the pot, but how little of each ingredient was actually called for…. Leftovers for the Freezer! Which means I’ll be serving up something pretty damn tasty on a weeknight very soon. Or maybe I’ll just save it for my next fancy dinner. Inpsiring! 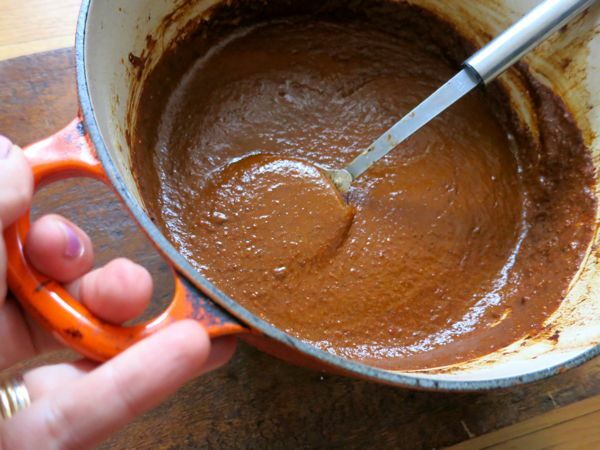 I’ve seen Rick Bayless make mole on his TV show, and it looks complicated but so tasty. I think my favorite part of your recipe is the leftovers for the freezer (from a fellow working mom!). Can’t wait for your next book! the pictures are beautiful!! and it looks delicious!! but, um, no. i wouldn’t have space in my rowhouse for all those leftover ingredients to hang out after i’d used those tiny amounts. 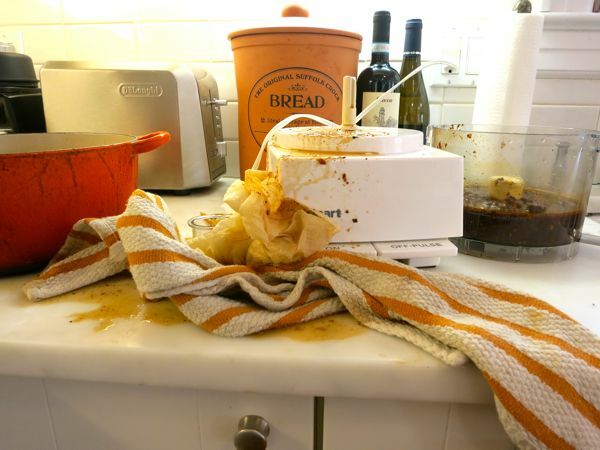 Regarding your new cookbook, I hope by “later” you mean in an hour……. This is so inspiring. Pierre ate pork knuckles in Port Chester last week. I’ll have to send him back…for spices, not knuckles! This is such excellent timing – I’m about to move to Port Chester and I’m so excited to go exploring there now! Thanks! Here is a 30 minute mole from this month’s Sunset magazine, for those who are drooling at this post but need to squeeze it in to a weeknight. Haven’t tried it yet but plan to soon! 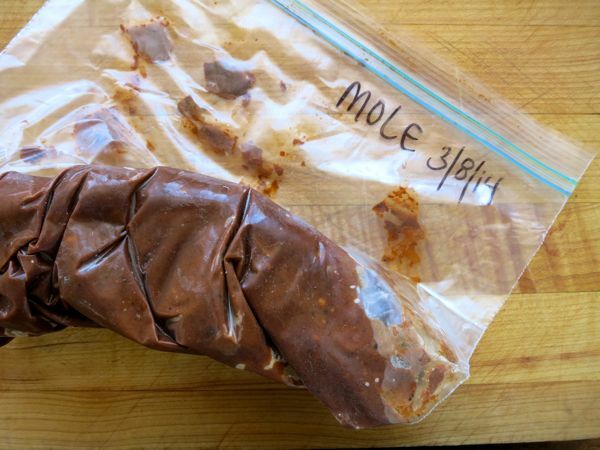 I’ve always been intimidated by mole, but have also been itching to try it. This might be the push I need- it looks beautiful. Love this!!! Special, complex, recipes always bring me back to why I love cooking! I mean, 5 minutes t-ball tacos are fun – but, there is nothing like spending hours on a lazy Sunday cooking away something spectacular. On another note, I’m cooking a French dinner party for some guests on Saturday – I’ve never made Julia Child’s coq au vin…..perhaps this will be the main course? Also want to hear about the new book! DALS is completely dog-earred at our house, just had your chicken and orzo soup tonight. Deconstructing dinner insight for that recipe that I discovered tonight by accident – if I just use a bag of baby carrots, not chopped, they are big enough to be easily avoided by the one child that doesn’t like carrots in soup. Love it when laziness leads to success. Do you like the bread crock and what do you keep in there? I have been contemplating them for a long time…. I had mole once at a Mexican restaurant and it was so spicy, my hair started sweating. That experience just about extinguished any further desire for mole. Ok, I need encouragement here– I get so bored with the same flavor profiles (I make a LOT of chicken with lemon, garlic, oregano- – or stuff with red sauce and basil– or a pan-fried something with a pan gravy or sauce of reduced wine)– yet I look at the Mole from Saveur and like a teen I instantly say, ew, cloves and raisins? So, do I make it without the items that turn me off or do I put big girl pants on and make it this weekend AS WRITTEN– I find myself avoiding things for this reason, even as I whine about not having enough variety in our dinner choices… help? 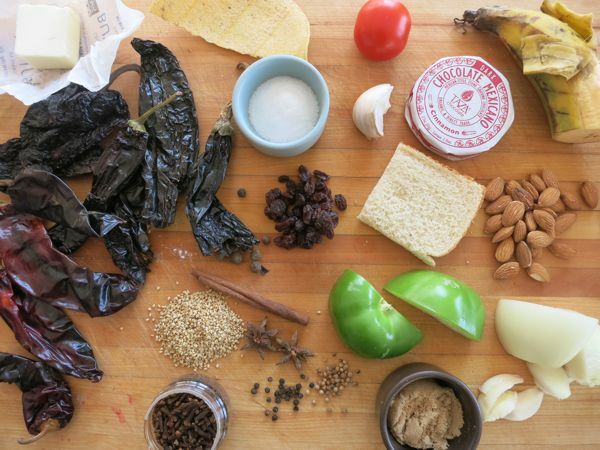 My husband loves mole but I have never attempted it at home. Love that you can freeze the extra. 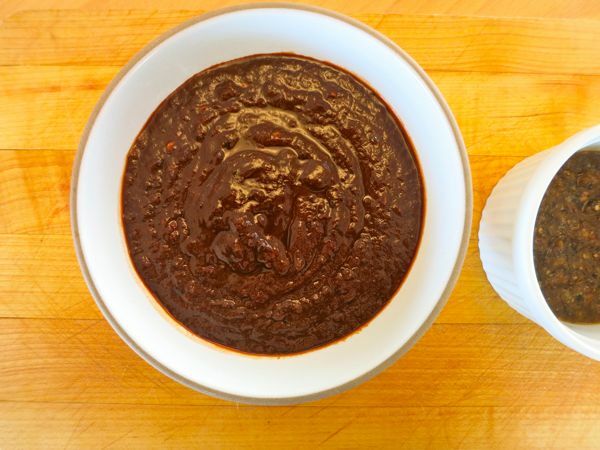 It’s wonderful to make mole but if you want some to have some available without the work, check out a Mexican grocery for powdered mole. It can be stored in the freezer pretty much forever and reconstituted with chicken broth (or water, or pork broth — you get the idea). Not only does it taste like the real thing, it is the real thing! YUM! Can’t wait to hear about your new book!! !